This is an update to a previous article about Jekyll Island development. The fear that development may ruin the pristine environmental character of Jekyll Island would be put to rest if a current bill making its way through the Georgia Senate is ultimately passed and signed into law. House Bill 715 would strip local authority of its ability to define how much land can be developed on the island and would instead impose severe development restrictions for the purpose of retaining Jekyll Island’s status as one of the most beautiful and well-preserved islands on the east coast. Currently the Jekyll Island State Park Authority must create a master plan that details how much land can be developed. This is based on a state law that mandates the preservation of 65 percent of the island’s land in an undeveloped state. The law, however, effectively allows the Park Authority to determine what is meant by the term “land.” This obviously creates tension between competing groups when new master plans are created. HB-715 abolishes the 65 percent rule and dictates that only 1675 acres may be developed on the island. The bill creates a definition of “developed land” and “undeveloped land” and while the definitions may allow for some wiggle room, they are certainly much more exact than the current open-ended definition of “land.” “Developed land” includes such things as golf courses, man-made ponds, and utility easements and “undeveloped land” specifically includes such things as marshlands, wetlands, and true wooded areas. More discussion of this is included in the original article. The bill also states that 1597 acres of the island have already been developed, which effectively allows for only 78 acres of new development. Should this bill not pass, the Park Authority is set to allow 326 acres of new development based on their definition of “land.” Based on local political and natural circumstances, future master plans may decide to include more or less. HB-715 is a strong showing of bi-partisan support for the protection of one of Georgia’s and the country’s most important and well-preserved natural environments. The bill passed the Georgia House by a vote of 156 to 1 and it has quickly moved through the Senate. Should it pass the Senate and be signed by Governor Deal, it would be a statement to Georgia’s recognition of the importance of natural environments, particularly our coastal ecosystems, and the state’s strong commitment to preservation. Our coastal ecosystems provide habitat to countless wildlife species, act as natural filters for the production of fresh water, protect the natural and built environment from storm surge destruction, and are beautiful examples of our planet’s engineering and aesthetic ingenuity. The House could have just created a simple solution to the debate over the meaning of “land” by just defining it, but instead it provided for strong environmental protections. Instead of maintaining the current 65 percent rule, it created a clear and quite restrictive rule on how much more land could be developed. Most noteworthy is that the bill severely restricts development on the southern portion of the island. In such portion, the Park Authority may not lease any property to commercial entities or to any entity for the use as a multi-family dwelling. The bill further states that the Park Authority may not renew any leases in the southern portion entered into after May 30, 2007, excepting only single-family uses. On top of that, the Park Authority may never dispose of any riparian rights and may never lease any beach property to any entity. Georgia has an opportunity to make a strong statement regarding its desire to lead in the protection of valuable natural environments. 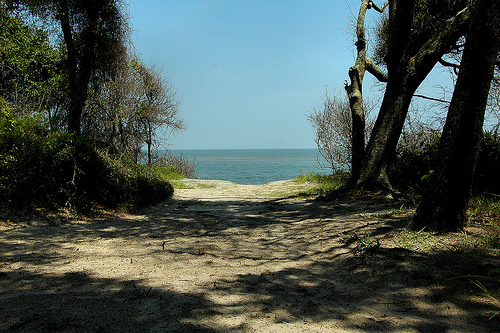 Jekyll Island has always been a shining example of Georgian’s understanding of the importance of coastal ecosystems and the need to protect them for both environmental and economic reasons. Let’s hope the island gets the protection it deserves. Update, March 18 2014: The Georgia Senate passed the bill 48-0. The only thing needed is Governor Deal’s signature. This is a great win for environmental conservation efforts and shows that Georgians can rally around our coastal region and make sure it remains one of the most well-preserved ecosystems in the country. Update, April 14 2014: Governor Deal signed the legislation to make it official state law.